Every day is an adventure at Camp Jaycee. Highly trained counselors and specialists lead the campers in terrific activities. The day is divided into five periods: three before lunch and two afterward, plus an evening program. Campers may go to the athletic field for a game of soccer or dodgeball in the morning; they might then visit the crafts area to create an art project. After enjoying lunch, it’s time for rest hour, followed by swim. The afternoon periods could be spent on a paddleboat, or maybe at nature or dance. There’s always fun things to do at Camp Jaycee. Swimming: Campers swim in our small spring-fed pond. The swimming area is sectioned off and is about three-feet deep. Boating: Groups of campers enjoy our paddleboats and rowboats. Arts and Crafts: We encourage creativity through painting, pottery and other projects. 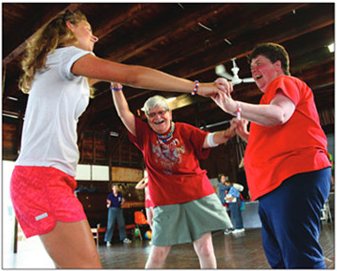 Dance and Movement: Our dance program encourages physical fitness, and aids with eye-hand coordination. 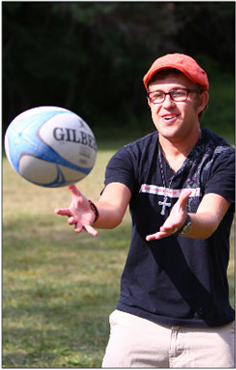 Sports and Games: Campers enjoy soccer, basketball, tennis, volleyball and group games. They develop their physical abilities as well as teamwork and social skills. 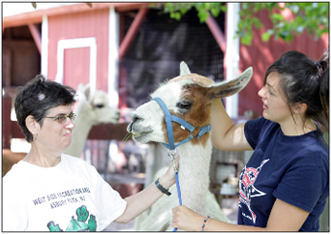 Nature: Llamas, rabbits, pigs and other animals inhabit the petting zoo. Campers also enjoy the beautiful natural surrounding as they go on short hikes. Evening Activities: Each evening, the whole camp comes together for special activities such as dances, plays, the Olympics, movies, and many more. The health and safety of our campers is our first concern. Our camp nurses are on duty 24 hours a day and staff a modern, well-equipped infirmary, where they administer all medication, provide both routine and emergency medical care, and offer comfort and support. We have a consulting physician available and relationships with several local hospitals for immediate access to more extensive care if needed. Campers eat tasty, nutritious meals, served in ample portions in our air-conditioned dining hall. They also receive an afternoon snack. Our counselors are wonderful, caring individuals, whose goal it is to make everyone’s stay at Jaycee special and memorable. Many return year after year. They are selected for their maturity and judgment and are then extensively trained. Campers are assigned to groups by gender, age and ability level, along with a counselor. This is where many friendships develop over the summer. They sleep in comfortable, air-conditioned cabins with modern bathroom facilities. Groups are small, with six or seven campers in each group, so they receive individual attention from their counselor. The spirit of Camp Jaycee is truly amazing. Campers come from all over New Jersey, New York and Eastern Pennsylvania to create a community of friends.